Poori masala with potato/ Aloo masala in Hindi / Urulaikizhangu masala in Tamil is the best side dish for poori. Last year I posted onion masala without potato which is my mom’s special recipe. But poori tastes the best only with potato masala or potato kurma as served in restaurants / Hotels. In Tamil we say this as “Poori Kizhangu” and in Hindi it is called as bhaji. In Tamilnadu, Saravana bhavan hotel poori masala is very popular. Iam yet to taste it. But the one I have shared here is also hotel style poori masala that is served in most of the restaurants in Tamilnadu. Yes, addition of besan flour is the secret for hotel style recipe. I made puri and this south Indian hotel style potato masala for our breakfast yesterday as my birthday special recipe. Some people use this potato masala for stuffing masala dosa too. But I make that masala slightly different. Soon I will post it here. You can do so many variations in this recipe by adding tomato, carrot, peas and making it without onion, besan flour etc. I have listed them in “Note” section.It tastes good in all the ways. 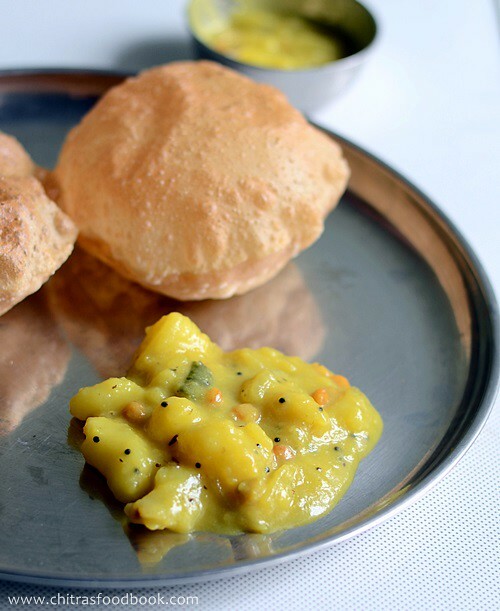 Here is our method of making this yummy side dish for poori. Lets see how to make hotel style poori masala @ potato masala for poori with step by step photos. 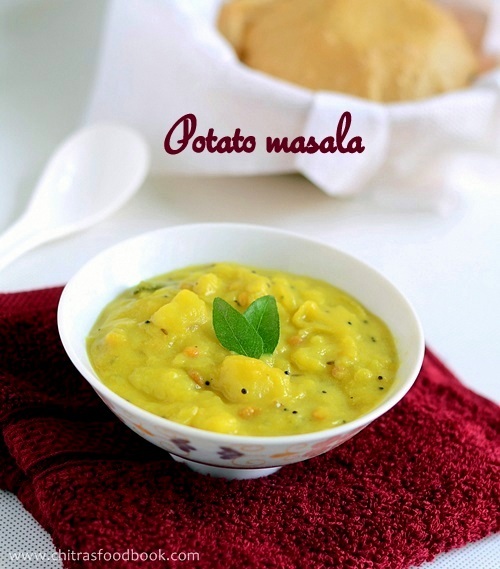 Wash and cut the potatoes into 3-4 pieces.Pressure cook them adding a pinch of turmeric powder for 4-5 whistles in high flame.Remove and peel the skin.Mash it roughly into big pieces.Dilute the besan flour adding 1/4 cup of water and set aside. Slice onions,chop ginger,Green chillies and curry leaves.Set aside. In a wide kadai,heat oil and do the seasoning part as given above.Then add onions,finely chopped green chillies ,ginger bits & curry leaves. Boil well for few minutes till onion gets cooked well & masala reaches semi solid consistency.Switch off the flame.Add some coriander leaves if necessary. 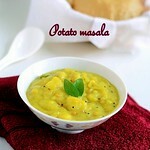 Potato masala is ready to serve with hot puffy puri ! For variations,u can add finely chopped carrots and a handful of peas while sauting onions.U can also add half of a finely chopped tomato. U can add besan flour or skip it if u don’t like tat flavour.But i add it to give the restaurant touch as well as to give a creamy texture. This masala thickens when it cools.So make it slightly watery before switching off the flame. Adjust the quantity of chillies as per ur taste.I don’t chop the chillies finely for my daughter’s sake.So i slit and add.But in hotels they do add them finely chopped. To make this as kurma,add some finely chopped garlic cloves and 1/2 tsp of garam masala powder. Puffy poori with this potato masala tastes like heaven for morning breakfast.Do try & feel it !! 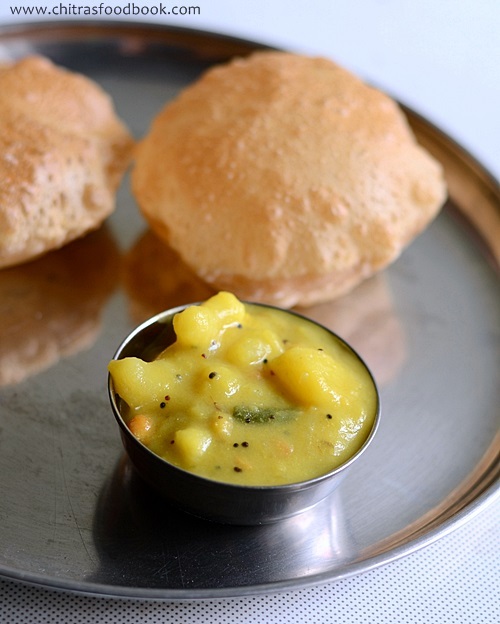 Don't forget to check out my puffy poori/Puri recipe with tips n tricks ! Fluffy poori with delicious potato masala....... Delicious combo!! perfect combo with poori..love it. fluffy poori's with yummy masala. appetizing. Thanks for the feedback esther :) I am so glad !